Pink and ruffles just go together, right? Right. And since I’m on this out of character quilt making kick lately a ruffle quilt seemed just the way to go. The woman that owns the little quilt shop I work at was working on a similar quilt to this one, and I helped her figure out the pattern and dimensions to make some kits for the shop. And that afternoon when I got home from work I pulled out all my pinks to see if I had enough to make my own ruffled version. 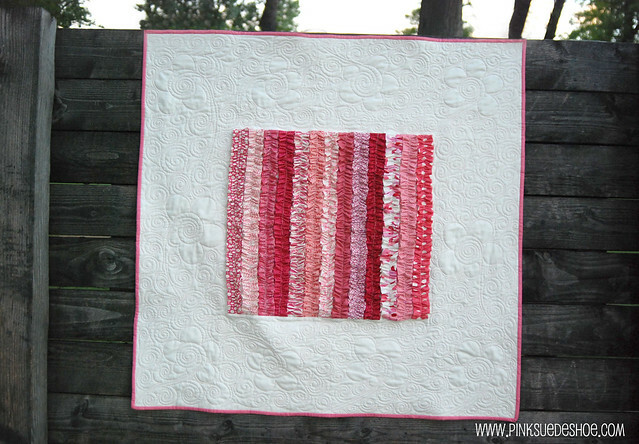 What I love most about this quilt, besides rows of pink ruffles, is the large white space around the edge. My friend Melissa at Sew Shabby Quilting filled it in with beautiful flowers and swirls and I couldn’t have dreamed up something more beautiful! 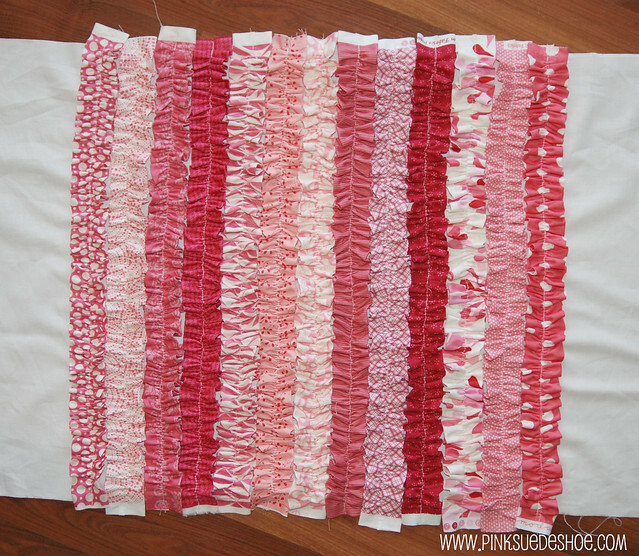 You’ll need:thirteen 4″x42″ strips of fabric for the ruffles. 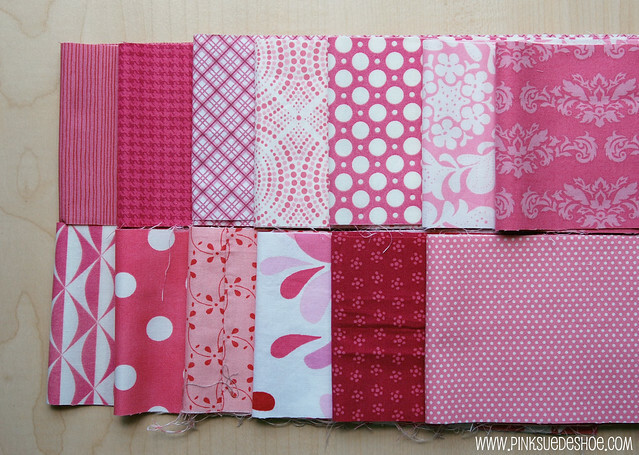 I was happy I had enough pink scraps to do this quilt almost completely from my stash. I choose to do mine all different, but you could repeat a few fabrics if you’d like. I thought of doing an ombre effect, but didn’t have enough of the dark pinks. (The ruffled quilt kits we have at the shop are blue/turquoise, greens, gray and yellow and are so so pretty!) I would suggest choosing dense/small prints, or one’s with allover color. I have one ruffle that was a large pink flower on white, middle of the bottom row below, and though I love the fabric I don’t love it as a ruffle because it mostly just looks white. I should have switched that fabric for something else. If you are buying fabric for this quilt 1/8 yard will do for each ruffle. (An 1/8 yard is 4.5 inches, and you’ll need to trim them down to 4″ wide.) I pieced a few of my ruffles together in the middle because I didn’t have a long enough strip left. And that’s OK too. You’ll also need 1 1/4 yards of white. I used Kona snow. The white I had in my piles was too white, and the cream I had was too cream. Kona snow is a great not bright white, not cream white option. That’s it for the front! You’ll need 1 1/3 yards for the backing fabric. I pieced mine together from bits left over from this project and a big, but not big enough piece. After you’ve cut your ruffles, let’s cut the white fabric to size. You’ll need one large 21″x21″ square, and two 11″x21″ strips. 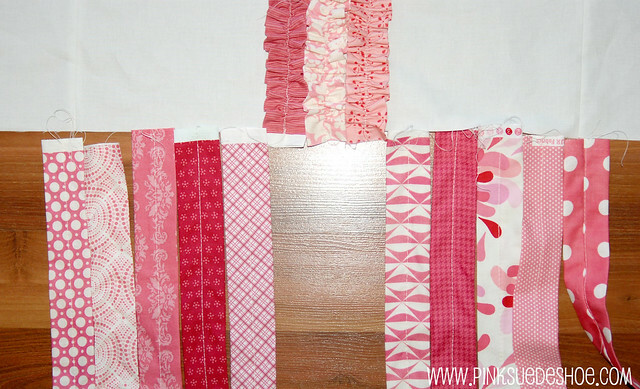 Cut your remaining fabric into two 11″xwidth of fabric (42″ish) strips. For this part you’ll need a roll of ribbon, or a long length of it. I don’t cut mine off the roll, I just roll it back up when I am done. So here’s my not so secret trick to make long skinny ruffles easy! 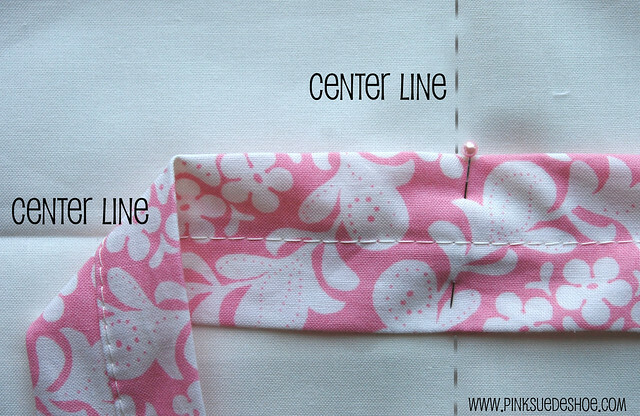 Take your 4″ strip of fabric and lay your ribbon across the top with about 1/2 inch hanging off one edge. 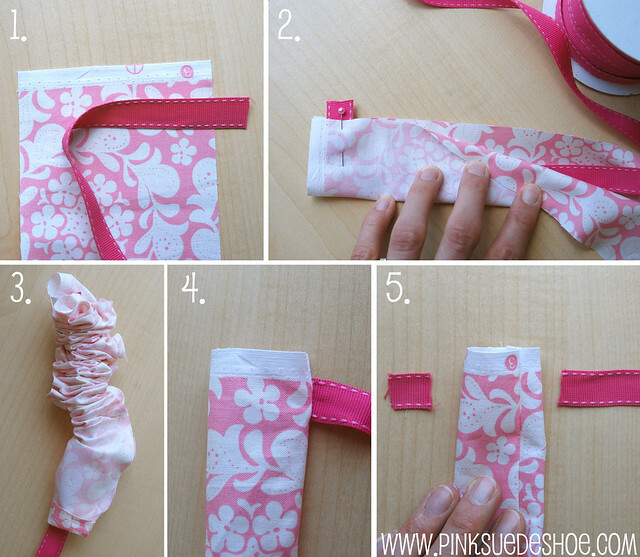 Fold your fabric right sides together and pin the ribbon in place. Make sure the ribbon is laying down right next to the fold. You don’t want to catch it in your seam. Sew a 1/4 inch seam along the raw edges. After you’ve sewn your ruffle, start pulling the ribbon tail. It will start to scrunch up, and you’ll just need to use your fingers to help it flip inside out. This is what it will look like when you are finished. 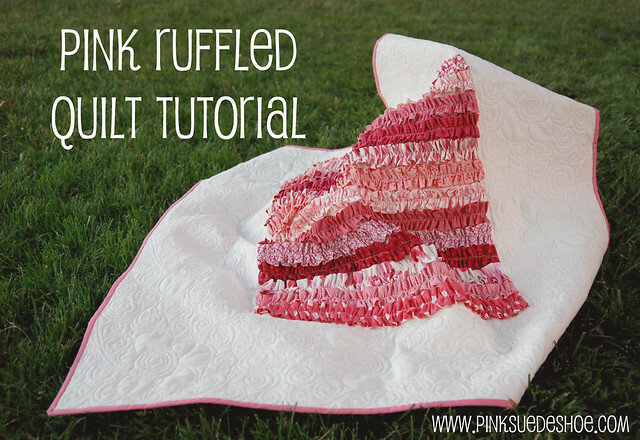 It only takes about 15 seconds to flip this whole long ruffle inside out. Tada! Magic. 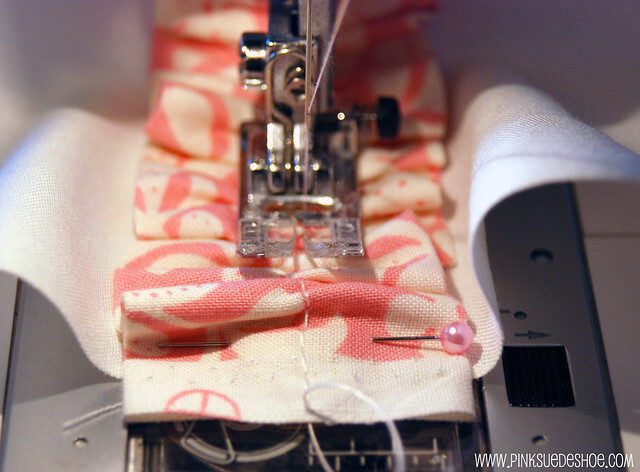 Carefully snip off the ribbon right at the seam on the outside (But don’t cut your fabric!) Then you can reach in and pull out the 1/2 inch tail from the inside. Then you’ve only lost 1/2 inch of ribbon and 15 seconds of time for each ruffle. Not bad at all! Now it’s time to start pinning on the ruffles! 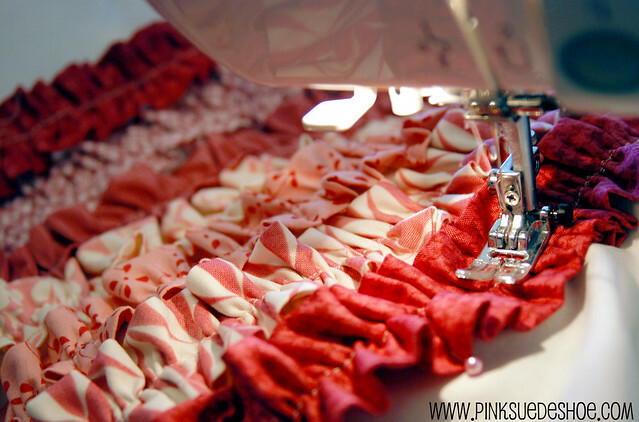 Find the center of each ruffle by folding it in half and marking it with a pin. 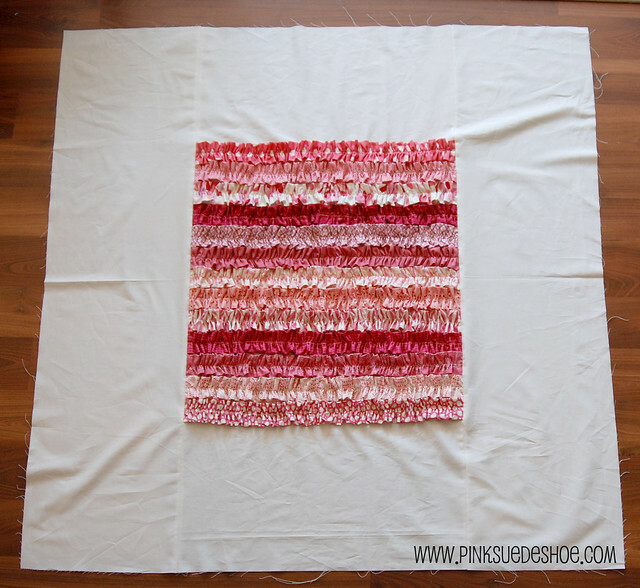 Then line up your first ruffle along the two center lines you pressed earlier. 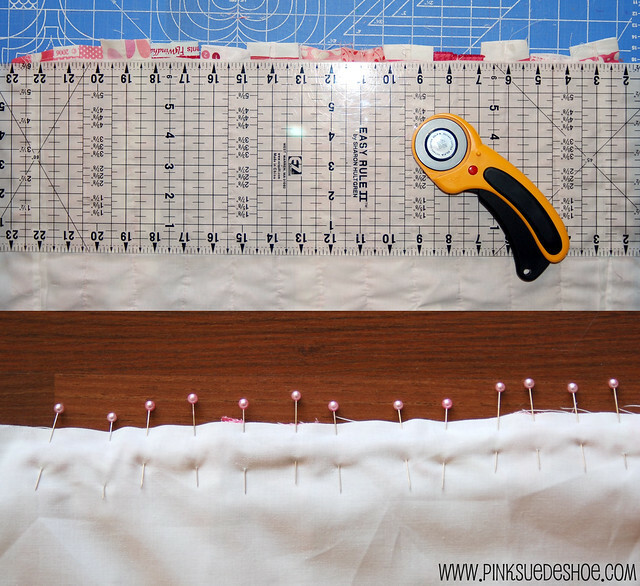 Pin it in the center, and then very carefully pull your bobbin thread to make gathers. Do one side at a time, the pin in the middle will help keep your gathers even from side to side. I used about 8 pins on each side of the center to hold my ruffle in place, and as straight on that center line as possible. Pull your thread gently, if it breaks you’ll need to pull it off and redo the gathering stitch. Stitch that ruffle right down the center. Make sure to leave the selvedge edges hanging off your white background square. You don’t want those to show up in your quilt! We’ll need to trim everything even when we are done with the ruffles anyway. And tada! You’re first ruffle is done. Now add one to each side, using your first ruffle and your pressed center line as a guide to keep things straight and even. Continue adding ruffles, one on each side until you’ve gathered them all up and sewn them all down. 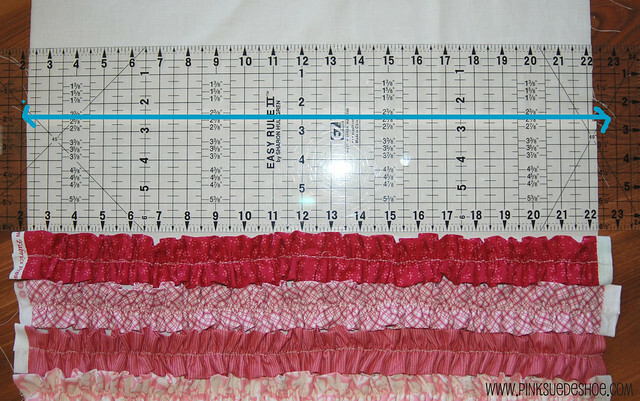 Every couple of row measure the distance between the side seam and your ruffle to make sure you are still straight. My seam is under the blue line, and thankfully my rows were still straight. If they aren’t, just adjust the way you pin on the next one to compensate for a little bit of slanting in one direction. I just used my regular sewing foot to sew these down, but if you have a walking foot you could use that too. I have a ruffler foot too, but since I needed these to be a very specific length I decided it was just as easy to gather them by hand. And tada! All those ruffles are sewn down. Try to keep the edges of the last rows of ruffles inside the side seams. This will keep your center square of ruffles a true square. Now it’s time to trim down the edges and add our other white strips. Measure the length of your center panel from edge to edge. It should be somewhere around 42″. Trim your remaining white strips to the exact length of your quilt x11 inches and pin them right sides together at both ends. Lay everything out evenly across the ruffles and carefully trim off the selvedge ends. Then carefully pin the raw ruffle edges into the seam allowance. I used one pin on each side of each ruffle. Which was more pinning than I usually do for anything, but I didn’t want any of those raw edges to escape the sewing machine. You want them sewn in really well so they don’t pull out and fray. Do the same thing on the other side and you are done with the top! Now do whatever it is you do to quilt the thing together. Me? Don’t enjoy that part at all. And my friend Melissa is a LOT better at it than me! So I took it to her. And she did an amazing job. After I got it home I realized that it needed some quilting in the middle of the quilt too. 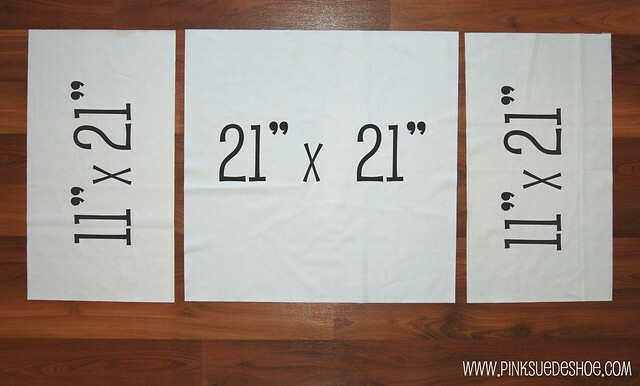 A 21″ square is a lot of space to not be stitched together! So I added a few straight lines between each ruffle to help hold all the layers together. If you send it somewhere to get quilted, you can ask your quilter to do this part for you. I didn’t think of it until after I started binding it, so I added these few rows of quilting after it was completely finished. I should have used my walking foot, but I really hate putting it on my machine, and I figured if it puckered or wrinkled then the ruffles would hide it anyway. Just make sure you don’t catch a ruffle in your stitching. You can either hold them out of the way with your fingers (my lazy girl solution), or you can pin them down so they don’t get caught in these rows of stitching. Don’t those rows of ruffles just make you want to touch it! 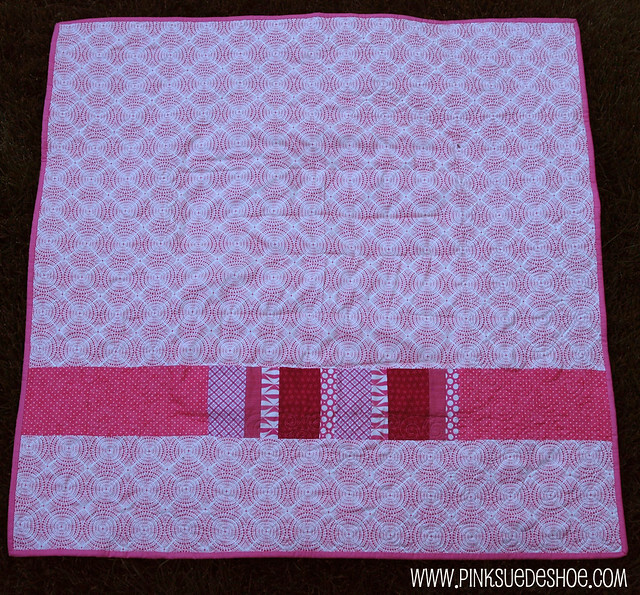 I bound my quilt with a solid pink, not cut on the bias. Here is a really good tutorial from Amy at Diary of a Quilter on bindings. I should have read it before I bound all those quilts a few weeks ago. She has some good info there and shares the secrets to making square mitered corners. 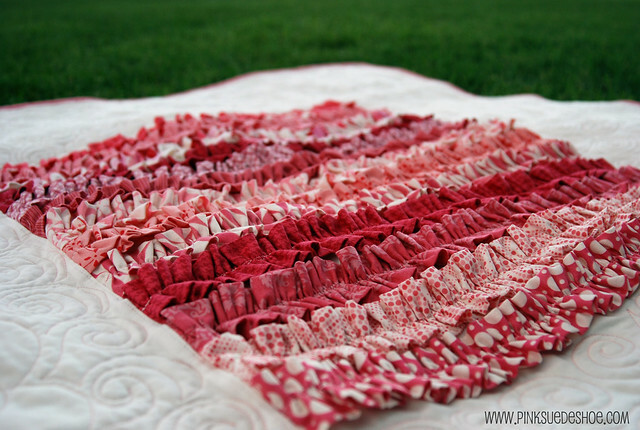 If you make a ruffle quilt, please let me know! I’d love to see your version, even if it’s not pink. You can add any projects you make from my blabberings on to the pinksuedeshoe flickr group. It’s still a little lonely. And boring. It’s only got my stuff in it. So if you have any projects you’ve made from my tutorials please add them! My pictures could use a little company. Love love love it! Awesome! I really do love it, did I mention that? Thanks for sharing this! Oooooo! It is beau-ti-ful ! I love National Pink Blog Party Day! It’s fun! So stinkin’ cute! Erika! I really can’t believe the bottomless well of your creativity! I AM SO MAKING ONE OF THESE! I’ve been looking for a good idea for Stef’s graduation quilt and there it is! Ta-da! What an awesome idea and GREAT tutorial. AND YOU HAIR IS PINKIFISCENT!!!!! You’re gorgeous. Now people will be able to tell you and your sister apart. Quick, take a family photo for those aunts and uncles! Oh my gosh. This is SO fabulous. I feel like I need to go make one. Like right now. LOVE it!! I am going to have to make one of these. So cute. I have to make this… if only someone in my life would have a baby girl. UH-mazing. Seriously. Bring it to our party, I want to see it in person. I can not even find the words to tell you how incredible this quilt is. Truly amazing. 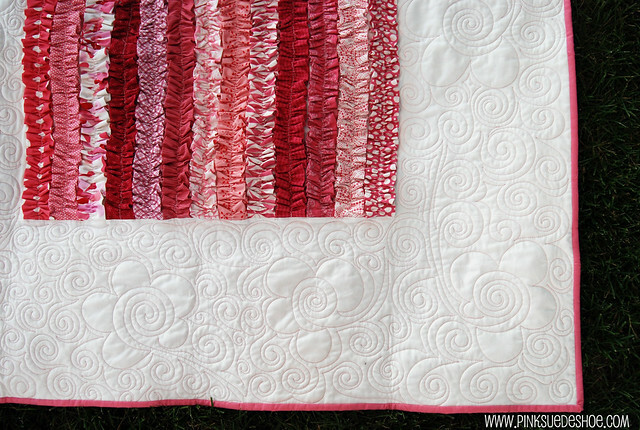 And, you’re right, the quilting pattern in the white space is gorgeous! I’ve never seen a quilting pattern like that. Perfect for this quilt. You are brilliant. The way you turned the strips out came in SUPER handy! 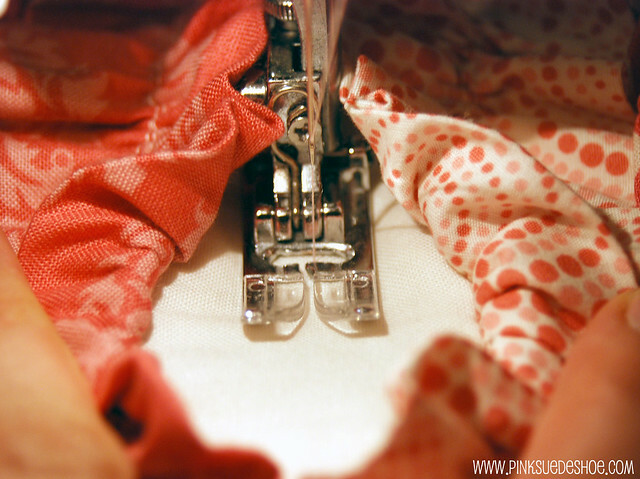 I referred back to your blog from my apron tutorial I wrote today! PS: The apron is pink! LOVE IT!!!! Thanks for the inspiration and information! 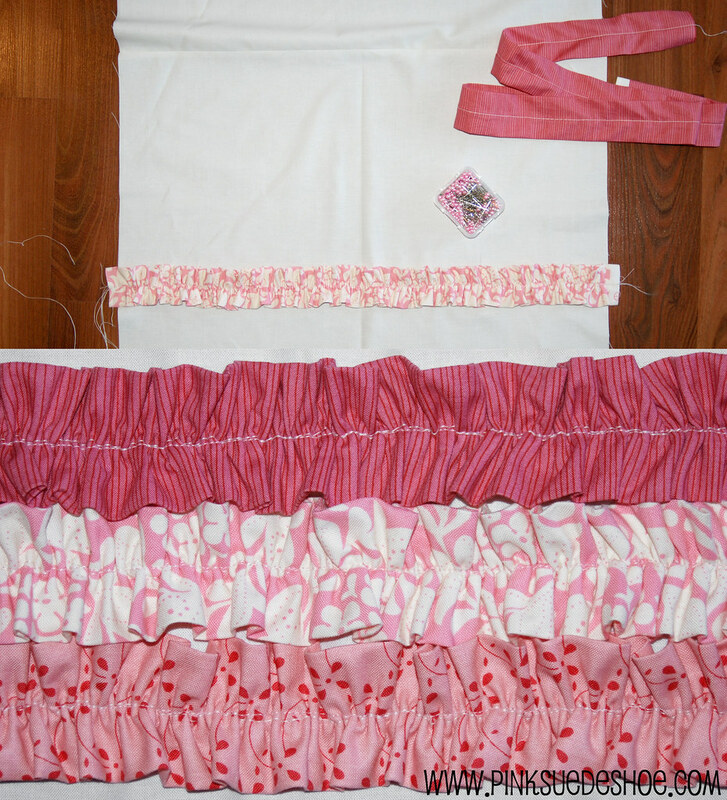 Thank you for the detailed instructions and pictures on how to make the ruffles! This quilt is so cute! I love, love, love this quilt. My daughter is going to college next fall. She chose a quilt from Urban Outfitters, but now it is out of stock. This quilt could be a definite replacement. It would also be perfect for a confirmand at our church. I am adding this pattern to my list of future projects. I LOVE this quilt. Any headway on the blue “not so ruffly” version yet? I’m having a boy and would love to make something for him along these lines that provides fun textures to play with, etc. Thanks for all your great ideas! Nope, not yet. My whole life changed last August and all my projects got shifted and reprioritized. A boy version just might not happen. Sorry! I completely understand. Life is like that sometimes. Thanks for the response! quilting thread it will be stronger !! It’s such a cute quilt! Are you having trouble making the ruffles or sewing them to the quilt base? If you hand stitch the ruffles instead of using a machine they look more like pleats instead of ruffles, just because of the way they gather. But if you are sewing them to the quilt base you can try hand stitching it and still get the same look. Or maybe switch to a different thread and see if that helps. Sometimes you get a bad spool (in my experience), rethread the machine, check the tension, and rewind the bobbin. All of those things could help your thread stop breaking. Good luck! I had this trouble too, on my first one( I am on #3) I changed it up a bit, and instead of ironing out the strips so that the seam is on the underneath side, I did it so that the seam is on one edge of the ruffle piece. Does that make sense? I felt the extra fabric from the seam was too bulky for a smooth gather. It works like a dream, and the seam is not noticeable at all. Hope this helps. I love the quilt. Texture quilts are great for little ones to feel all the different surfaces. If you have a tube turner , it is a fast and easy way to turn tubes, also. wow this is gorgeous! i’m imagining blues and greens and spirals instead of rows… it gives me sooo many ideas! !